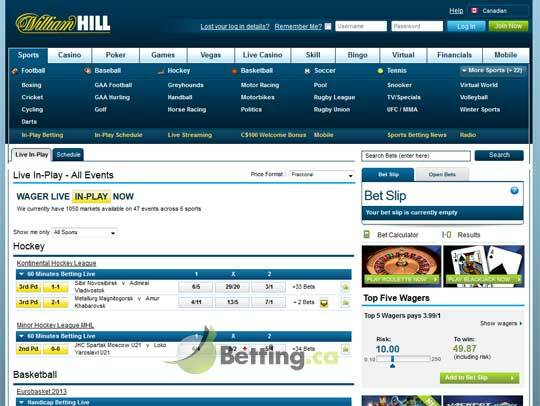 Even people who are not into betting are familiar with the name William Hill. It was founded in 1934 and it still carries the name of its founder, even though its ownerships changed on more than few occasions over the years. Now William Hill is public traded on the London Stock Exchange, it employs about 16,000 people and it has a profit of almost £190m per year. Even though its role and reputation as a sprotsbook is undisputed, William Hill also offers an online casino website, a bingo website and a poker website. 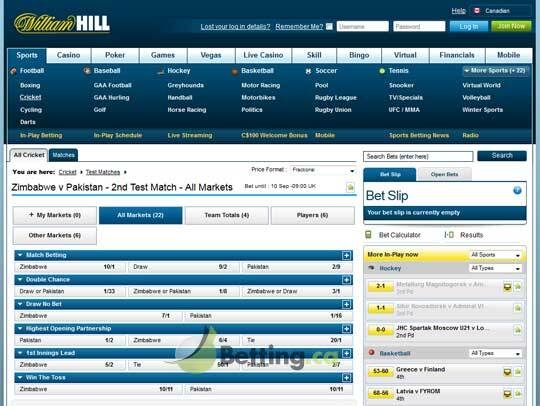 William Hill is divided has a retail and an online department, and US and Australian branches that are registered separately. Is there a limit on the amount I can win on a bet? How much can I win on North American leagues? Can I use the 'Cash In' option if I am betting on hockey? Can I register a second credit card as a payment method? Will I be required to verify my identity? William Hill offers a wide range of sports and sporting events and, honestly, it is more difficult to find something that you can’t bet on. 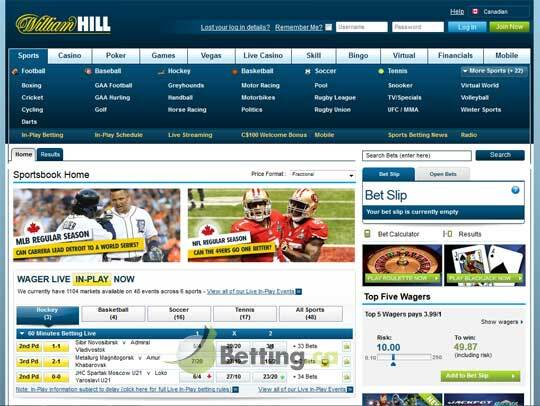 Once you open the website you will see, at the top of the page, the most popular sports for that particular period of the year, but if you click on ‘More Sports’, everything that William Hill offers will be presented. There are over 25 sports that you can bet on at William Hill. The list includes the obvious popular choices like soccer, basketball, ice hockey and tennis, but also a range of other sports like hurling, handball and probably sports you’ve never even heard off. You can choose how you want to see the odds, whether as decimal, fractional or American (money-line). On the main page you will also see the events that are already underway, as well as links to useful articles. Placing a bet is really easy, all you need to do is select the event and click on the odds of the selection that you want to place and it will be added to your virtual bet slip. If you select, say ‘Ice Hockey’, you will see a list of all the ice hockey competitions that are offered, along with the types of bets that you can place. So, for instance, if you want to bet on NHL, you can choose the type of bet. There is a range of options, including: First Goalscorer, Total Goals, Draw No Bet, Method of Victory and many more. In addition to betting on individual games, you can also bet on which team is going to win the Stanley Cup or the Conference. There are similar options for other sports as well. In addition to sports you can also bet on a selection of non-sporting events. Moreover, you can also bet on e-Sports. When it comes to events non-related to sports, you can bet on political events like the US elections. In the ‘TV/Specials’ category you will find betting odds for events like who’s going to be the next Pope, the next James Bond, or the Oscars. You can include one or more selections on your bet slip and it is also possible to make a range of combinations, known as combination bets. With parlays, every selection has to win in order for the bet to be winning as a whole. You no longer have to hurry to log in to your account before a game starts, because with the Live, or In-Play betting option you are able to place a bet on a game after it has started. Even if it is a hockey match and two quarters are over, you can still place a bet on the outcome of the last quarter taken separately, or the game as a whole, plus a lot more other options. The odds are set to match the current result and the match and what the participants have presented up until that point. In addition to betting on games live, bettors with active real-money accounts at William Hill are also able to watch a selection of sports events live, via streaming. That is very convenient for bettors who want to bet live, in-play, because they will be able to decide which bet to place based on what they see in the game. Bettors who are not in a position to watch, can listen to the live radio streams, aired on William Hill Radio. Bettors who enjoy betting while they’re on the go, either on their mobile phone or tablet, are able to do so at William Hill. The first option is to open the website in your mobile browser, log in, and start betting. But, there is another option, which is preferred by many. Namely, you can download the William Hill Sports app on your iOS or Android smartphone or tablet, install it and then log in through the installed program. The iOS app can be downloaded directly from the App Store, whereas for the Android app there are instructions on the website. William Hill still doesn’t offer text and phone betting for people outside the UK. Canadian bettors who are new to William Hill can benefit from a $100 Welcome Bonus. It is really simple, all you need to do is register at William Hill, enter the promo code CAD100, and then make a deposit of up to CA$100. You will receive a bonus in the same amount of the deposit you made, up to a total of $100. You can also benefit from enhanced odds on certain games. That means that you will get more favorable odds than the odds that are usually offered, which will significantly increase your chances of winning. Enhanced odds are offered on quite a few hockey games and selections, as well as other sports that are popular in Canada. Canadians can choose from a selection of accepted payment methods, including InstaDebit, which is a particularly popular Canadian payment method. Furthermore, you can also use your Canadian credit or debit card. Visa, MasterCard and Diners Club cards are accepted. The minimum deposit is $10 and players are able to set their own depositing limits, either per day, week or month. Deposits are usually processed instantly, whereas for withdrawals you might have to wait up to 5 working days. The minimum and the maximum amount that you’re allowed to withdraw may vary, depending on the chosen method, but, generally, you won’t be able to withdraw more than $150,000. William Hill doesn’t charge any fees for deposits and withdrawals. William Hill offers live customer support at any time of the day or night. You can reach them either on 0800 085 6296, at customerservices@williamhill.co.uk, or if you want to keep things simple you can chat with a staff representative directly though the website, via their live chat channel. Yes, there are limits of how much you can win at William Hill. The limits depend on the sport and league in question and are expressed in UK pounds. The limit for markets like – to win match, league, tournament is £250,000, whereas the limit for all other markets is £50. Yes, hockey is one of the sports where cashing in is permitted. You can, but only after you remove the existing one. Yes, your identity will have to be verified, so that the operator will be certain that you are over 18 and legally allowed to bet. The popularity of William Hill as a betting operator speaks for itself, but it should be said that William Hill is popular for a reason. It features one of the most extensive range of betting options, it has a solid Welcome Bonus, mobile and live betting are available and bettors can always rely on the helpful customer support team if there’s anything wrong.